Where do you see yourself in five years? No matter how old we get, this question never becomes less annoying. Whether we’re interviewing for a new job or even thinking back to our post college days right before we landed our first job–no one wants to answer this question. Now, where do you see your business in 5 years? Can you imagine your perfect office lease? Here comes the even more annoying part. These questions are actually pretty important. Especially when it comes to running your business. Why? Well, eventually you reach that point. You blink an eye and you’ve arrived. “Welcome to Five Years From Now! How’ The View?” If you’ve made a plan, the view is probably pretty great. It may look different than you had imagined, but nonetheless you’ve worked exceptionally hard and arrived at a point that’s pretty comfortable. For the most part, it’s smooth sailing from here. For the sake of conversation, let’ say you didn’t make any sort of plan (uh oh). Well, the same amount of time has still passed. Sure, you’ve achieved some things and had some good experiences, but something is about to run amok. Scenario 1: Your business has exploded! It’s thriving and things are moving right along. They’re moving along so quickly that you can barely fit everyone inside the building! Scenario 2: Your business is shrinking or changing and you can’t quite afford the space in which you currently reside. What do you do?! Here we will discuss a step-by-step method that is sure to make things much less stressful and much more manageable. Before we begin consider this: Your strongest allies in this process will be negotiation, your leasing agent, time, and above all patience. Is your business growing, shrinking, or stable? Answering these questions will allow you to form an outlined checklist or better yet a rubric. The more organized this process is the less stressful it will be. Let’ consider a few scenarios with possible responses to our three questions. Scenario #1: My business is stable, but I’m planning to take on at least 2 more employees in the next few years. -You’ll want to make sure you have enough space to accommodate these new employees comfortably, without changing the dynamic of the office. It can be VERY beneficial to include growth rights within your lease. Scenario #2: My business may be downsizing in the near future, but I’m not keen on relocating. -If you are very attached to your location, this is the perfect opportunity to renegotiate your lease. .
-Even if you are not downsizing, renegotiating is always an option! –This is actually a positive. The tighter your budget, the more specific you need to be. If you know exactly what you want your broker will have an easier time finding your perfect lease. Scenario #2: I have a pretty decent sized budget, but I’m not quite sure what I want. -This is good and bad. The positive is that the bigger your budget the more room you have for modifications. The negative is the less specific you are about your needs the longer the process will take. In either case, mapping out your budget will allow for a clearer understanding of what you will be spending. If you’re looking for a space downtown here are the prices you can expect based on class. For this question we’re not going to use scenarios. The timeframe has a lot of components. On average it can take between nine months to an entire year to secure a lease for a business of just 5-20 employees. If your business has over 100 employees it could easily take 1.5 years. REMEMBER: Time is your ally. Time is your ally in real estate negotiation. Be aware of your time constraints. The last thing you want is to be caught in the lurch making rushed decisions and thereby losing leverage. As part of your rubric make yourself a timeline. Here are the components you will need to complete it. Architectural and engineering plans much be approved by the city. This typically entails a few hundred dollars in fees and between 6-8 weeks of waiting time for approval. You can expedite this process to just 2 weeks. However, this increases the price to a few thousand dollars. Rarely does this aspect go without a hiccup. Be prepared for more time and if the planning is not done properly, more cost. Building out a 20,000 rsf office could take upwards of 2-3 months. Don’t forget about landlord response time. Often a landlord is occupied and may take days, sometimes weeks to make a decision. Now you’re in a great place! If you’ve followed the steps thus far you’ve created a pretty solid outline. You know your budget, your timeframe, and your likelihood for growth or reduction. Let’ fill in the details. If you have decided to stay in your current location, that’s great, it’s time for renegotiation. If you have decided to expand it is time to consider the type of space that will suit you best! There are three categories of properties: Class A, B & C. Depending on your budget, the image of the firm you are trying to portray, and the quality of property you require. This can vary greatly. It’s important to understand the differences in class of property. Before you have your heart set on a space, be aware of how your employees are getting to work. Note if you will need to be close to public transportation and/or set aside a portion of your budget for parking, if need be. Consider this when determining the amount of space you will need. Will you be hosting clients in your space? Does your space need to reflect your image? The industry standard is about 250 square feet per person. Multiply this by the number of employees and you will have the approximate square footage you will need. If you are regularly hosting clients in your space it is important to have a clean, peaceful area to conduct business. For example, a nice conference room near the reception area is common. Having a kitchenette near the conference room makes sense. Potentially having an office or two for guests to use is a nice feature as well. The only thing left to decide is the length of your lease. Landlord’ prefer to sign longer terms lease, and are more willing to reduce rents and increase concessions with the longer term. Shorter-term leases provide more flexibility to the tenant and typically are at a premium. The rubric is now complete. You should have all the details listed and organized. The only thing missing now is the lease. Read below for our last three tips! There are a few different ways to secure a great lease. Our suggestion is to contract with a commercial real estate broker and a real estate attorney. This allows for the least amount of headache and the fastest acquisition with the best deal terms. If you choose to use a commercial broker we believe it is very important to find one whose agency represents only tenants. The conflicting interests of an agency that represents both tenants and landlord can be harmful. The broker’s role is to minimize cost and the attorney’ is to minimize risk. Both are very important. However, the real estate attorney only comes into play after the space has been chosen and the broker has negotiated the business terms. Attorneys may have less knowledge on the business side of the equation. We suggest that this negotiation should be left to the broker. Likewise, the legal terms of the lease will need to be reviewed by a qualified real estate attorney- not your estate planner, IP attorney, or medical malpractice lawyer. Negotiation is key. A tenant might be able to directly negotiate (without a tenant representative) an additional 5%-10% off the original asking price. We suggest utilizing a commercial broker, as he or she may be able to negotiate 25%-35% off the original price. This includes free rent, tenant improvements, moving allowances, reduced escalations and reduced securitizations. Free rent is becoming less and less common. However, the longer your lease (more years of term) the more complimentary rent you will receive. Up until recently, one month of free rent was allotted per lease year of term. However, that too is dependent on other factors. For instance, if a larger tenant improvement allowance was negotiated you may be entitled to less free rent. A company is an organism subject to growth, reduction, but most of all change. It is a good idea to give yourself the flexibility to sublease should your financial, special, or general situation change. Most all leases come with the ability to sublease. The difference will be in the terms of the sublease clause. This includes: the amount of time allowed to notify the landlord, how much control the landlord possesses in the process of determining ability to sublease, who the tenant can sublease to, whether or not the landlord can take back possession of the space relative to what you are subleasing, and how the profits (if any) are shared. We feel that co-tenancy is not typically a good idea as it complicates the entire process. If you need to cotenant with another business, make sure you are both on the lease. Landlords prefer one entity, so that alone makes it a more difficult negotiation. Make sure that each party is responsible for their proportionate share. This can be difficult to achieve, as landlords would prefer to write two separate leases. We only suggest this to people who are very trusting of their co-tenant. In those scenarios, typically one tenant is on the lease and the other has a sublease agreement. We would highly suggest that you take caution when entering into agreements of this nature. 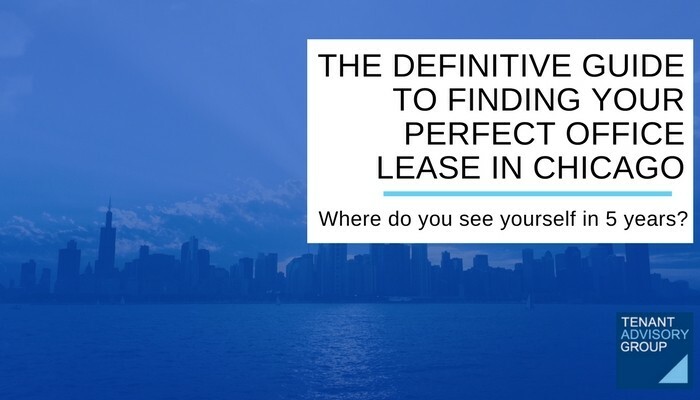 You have safely made your way through the guide and should be ready to take on the challenge of finding that perfect lease! The best way to do this is to know exactly what you want down to the smallest detail. With this guide you will hopefully have a clearer picture of your process and what it entails. For more information contact Bill Himmelstein of Tenant Advisory Group.